AV gear-maker Pioneer was one of the first to roll out support for Apple’s AirPlay technology with its AV receivers, and now the company is offering two new Music Tap speaker systems with Apple AirPlay support, so users can access their iTunes libraries just by connecting the Music Tap systems to their home networks. Plus, the systems support DLNA too (so users can pull in media from non-Apple sources), and the units can be controlled with Pioneer’s free controller app for iOS devices. The Music Tap systems will be available in two flavors: one Pioneer-branded and one Elite-branded. Both systems feature a 2.5-inch LCD display, a 2-channel digital amp, and dual full-range drivers in a passive radiator enclosure designed to deliver crisp sound with accurate low end. The Music Tap systems connect to a home network via Wi-Fi; from there, the system can tap into iTunes libraries shared out via iTunes 10.1 or later, or on iOS devices running iOS 4.2 or later—and that includes AirPlay-enabled apps like Pandora Internet radio. With iTunes 10.1 or later, users can also stream music to multiple Music Tap systems around a home network. The Music Tap speaker systems also feature vTuner Internet radio (enabling users to access more than 16,000 Internet radio stations from around the world), and the systems are DLNA 1.5 certified fo users can pull in music and audio from other DLNA certified network devices in the home, including NAS servers, game consoles, PCs, and more. The main difference between the Pioneer-branded Music Tap and the Elite-branded version is that the Elite version ships with a two-year warranty and built-in Bluetooth 2.1 that supports Pioneer’s AirJam app, enabling up to four Apple devices to create a collective playlist for use on the Music Tap system: one connected, users can cue songs from their own music libraries for the Music Tap playlist. (A separate Bluetooth adapter is available for the Pioneer-branded version.) The Music Tap Elite also features tuned performance by Pioneer’s TAD director of speaker engineering. 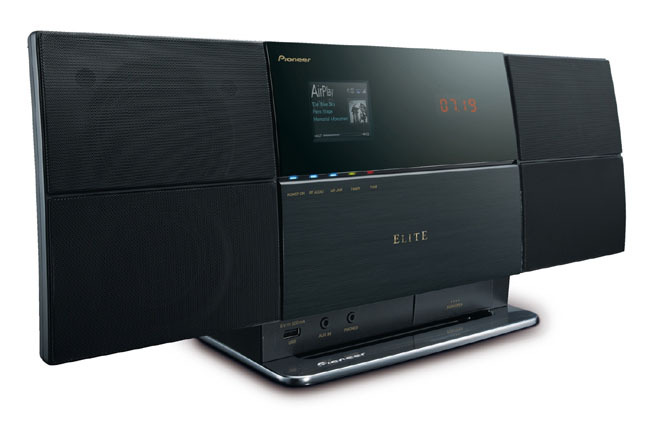 Pioneer says the Music Tap Elite systems will be available in October; the Pioneer-branded version will carry a suggested price of $399, while the Elite version will go for $479.